Categorizing myself as an omnivore feels like an understatement. The list of foods I don't eat is so small that my friends can probably recite it from memory (in case you care: blue cheese, raw celery, black licorice). And while this blog leans heavily on the eating out part of my life, you should know that I also cook and eat in quite often as well. I cook meat all year round but there's nothing quite as exciting as the summer grilling (and smoking) season. 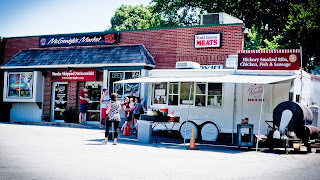 Most of us have been grilling at least since Memorial Day but I wonder how many have been taking advantage of of Kansas City's local butchers as the source for their meat. After all, your meal is only as good as the ingredients you start with. Local Pig is the brainchild of Chef/Butcher Alex Pope (former chef at former restaurant R Bar) and though it opened its doors just over a year ago, has gained national attention for quality meats and Pope's unique outreach classes (How to Butcher a Hog's Head is the one I attended). 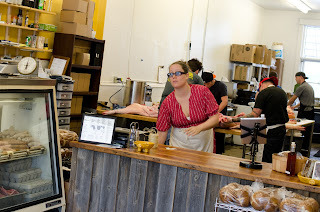 At Local Pig you will find meats that are not only hormone, steroid, and antibiotic free but I suspect that Alex can tell you the name of the small farmer that raised the animal that will soon grace your table. That's no small thing. Knowing the provenance of your meat is one of the surest ways to ensure that you are supporting your own health as well as the health and well being of the animals in our food chain. the meat counter and register. Local Pig is admittedly hard to find for first timers (unless you are a fan of live Blues/Rock. Then you only need to know that it's located about one block from Knucklehead's Saloon). It's in Kansas City's East Bottoms, just a stone's throw from the River Market. I struggle to effectively describe the location but will say that it grows on you. Once inside you will find yourself in a large room that is home to the meat cases and on the other side of the retail counter, the butcher area. It is not unusual for meat cutting (and sawing) to be taking place in plain view while you order your pork chops. I happen to like that aspect of the place, though it's certainly not for everyone. While I routinely patronize 4-5 local butchers, Local Pig edges out the others as my favorite. I can without hesitation say that the very best pork shoulder (for smoking pulled pork), Easter ham, and pork chop that I have ever eaten were purchased here. Heritage pigs (like Black, Duroc, and Berkshire) are a big part of the secret. They simply have more flavor than what you're buying at the grocery store. I promise to dedicate an entire post to this gem sometime soon. Bonus: Pope's Pigwich food truck parked outside makes amazing sandwiches. I'm always a little surprised by how many people have never heard of Bichelmeyer's Meats. Generations of the Bichelmeyer family have been operating this place in Kansas City, Kansas for over 65 years and the family has been in the Kansas City meat business since the 1890's. (That. Is. A. Long. Time). The meat case at Bichelmeyer's is l-o-n-g. The first thing you'll notice when you walk through the door is a meat case that goes on forever - it's roughly 70 feet long if my estimation skills are any good. This case is filled with nose-to-tail cuts of just about any standard meat you can imagine. You'll find all your basic cuts as well as quite a few exotic or ethnic cuts not offered in most grocery stores. In addition to regularly buying steaks, ground chuck, bacon, and brisket I have also purchased pork belly, oxtails, and lamb necks here. It's worth noting that the Bichelmeyers take great pride in knowing the origin of the meat they sell. 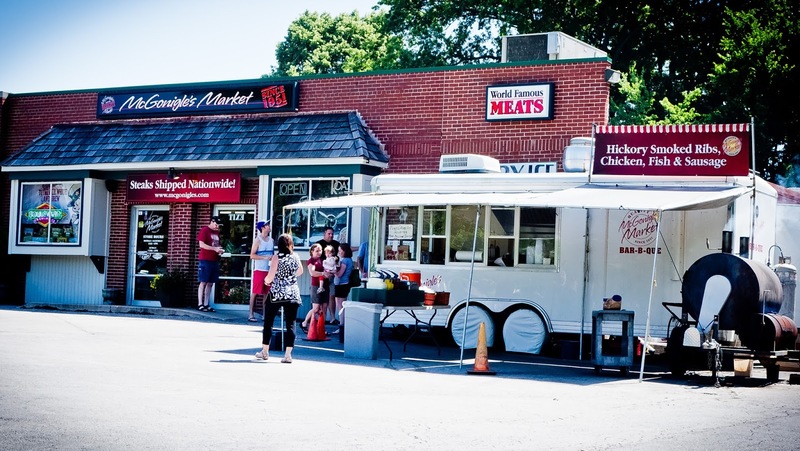 According to the owners they only sell fresh meat from local producers including Bichelmeyer Land & Cattle in Williamsburg, Kansas. This place is old school. Spools of white twine, rolls of butcher's paper. If it's busy, take a number. Use the extra time to window shop. 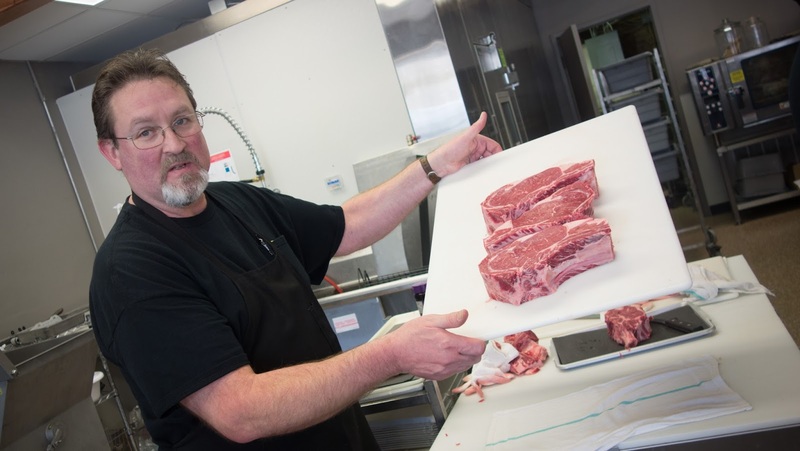 Bichelmeyer's is staffed with lots of really knowledgeable butchers and assistants. They get to you fast and are super-patient and helpful answering any question you might have. Don't see what you're looking for in the case? Ask. Want your ribeyes (or whatever) cut thicker than what's on display? Ask. Good, good people work here. Bonus: On Saturday mornings the staff sell fresh made tacos. lunch wagon are pictured here as well. Like Bichelmeyer's, the McGonigle family has been in the Kansas City meat game for a long time. Founded in 1951 McGonigle's Market is really a small grocery store not unlike what you'd find in an urban center like New York. You could literally buy everything you need for a gourmet meal inside (including wine, cheese, produce, gourmet pasta, and of course quality meats). Because of it's proximity to where I live McGonigle's was my first Kansas City butcher. It was here that I discovered the wonder that is Berkshire pork. The first time I bought and cooked a Berkshire rib chop from McGonigle's was nothing less than an epiphany. Who knew that the "other white meat" of my youth, that dry, flavorless pork was capable of being so much more? These chops were marbled like a good steak and full of flavor. No more lean pork for me. Ever. In addition to very high quality meats, McGonigle's offers some of the area's best fresh fish and seafood - not too common in KC. to business associates and they always get great reviews from the recipients. Greg Madouras and some nice cuts of meat. Compared to the butchers mentioned above, Broadway Butcher Shop is a new kid on the block (but not the newest). As its name implies, this shop is located on Broadway - in Midtown just north of 39th Street. Owner Greg Madouras opened this butcher shop last December and I have been there three or four times. Like Local Pig, most of the meat cutting is happening just beyond the meat case. That meat case by the way holds a relatively small but well selected variety of all natural, hormone free beef, pork, lamb, veal, chicken and fresh fish. Beef includes dry aged, Wagyu, Prime and Choice. Pork is typically heritage breed Duroc. The fish selection is quite good and represents what is currently fresh and readily available - including sashimi grade items flown in fresh from Hawaii each week. Homemade sausages are also available. Broadway Butcher does a nice job keeping Facebook followers up to date on what's fresh and in stock. 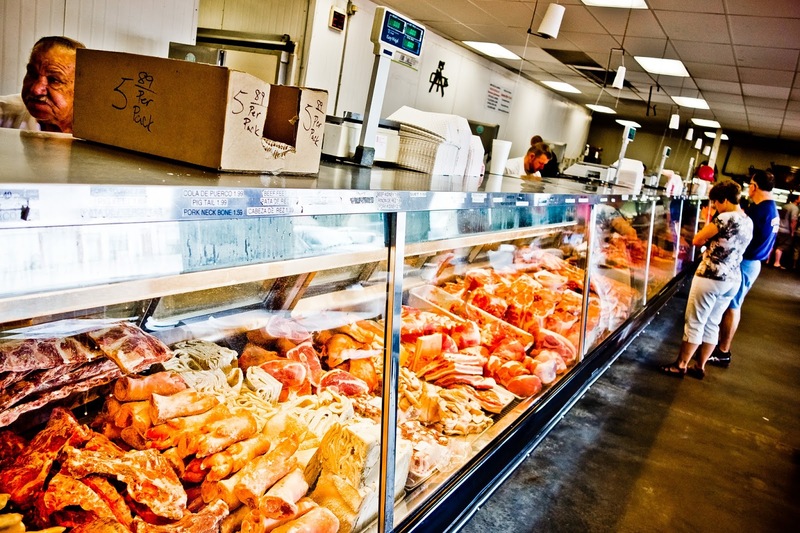 This is especially helpful for seafood lovers as the selection can change dramatically from week to week. of Madouras' tasty Bourbon-Cured Salmon. Tasty! 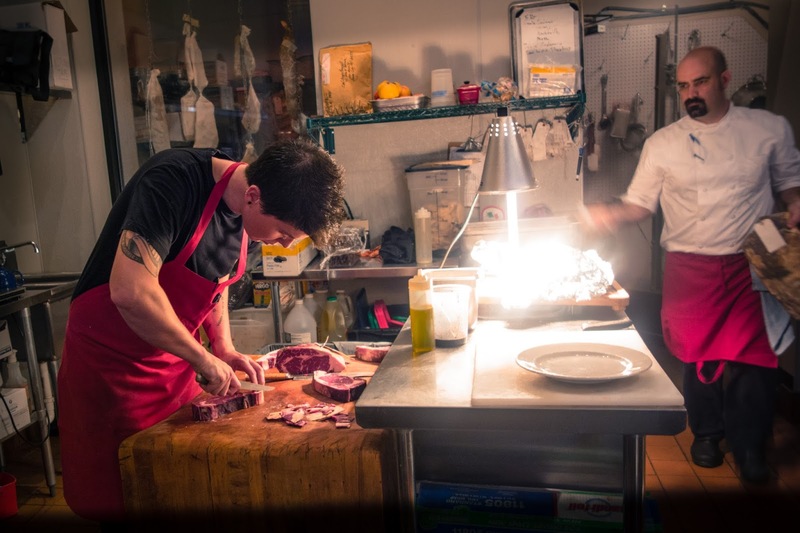 OK, I love this photo of my ribeyes being cut at Anton's. Is there room for another quality butcher in KC? Apparently yes, as Anton's Butcher Shop opened at the edge of the Crossroads District several months ago with its conjoined sister restaurant, Anton's Taproom. I honestly didn't even know the butcher shop was a thing until my wife Shelly and I had drinks and dinner at the restaurant a couple of weeks ago. Anton's meat case is decidedly small but what's in it is worth a try. During my one visit this included some impressive looking dry aged steaks. I bought three ribeyes to grill at home on Father's Day. Delicious. And their space is the setting for my favorite photo of the month (above). 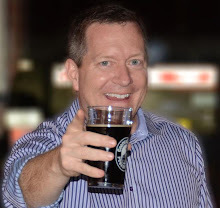 Kevin - I agree with KR thanks for the shout out to Bichelmeyer's. 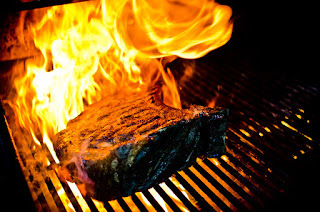 I might be a little biased (my Dad started the place) but I don't think you can get a better ribeye steak anywhere in the world. Thanks for getting the word out. Cheers! Thanks Mary! I've read your book "Lunchmeat & Life Lessons" btw. Good stuff. I'm also friends with your nephew (I think) John and his wife Julie. WOW! Just stumbled upon your blog. and yup - you have a new follower. :) Do you know which of the local butchers would be the best to go for humanely raised meats? I know the local pig touts that and steves meat market over in desoto - but wondered if you had an opinion? Good question Melissa and I'm afraid I don't have a ready answer. You are correct that Local Pig touts that fact and I don't doubt them at all. Your best bet is to ask the butchers themselves. Missed Connections - Is This Seat Taken?